If the sun always shines on the righteous, then the Liverpool International Festival of Psychedelia must be very, very good indeed. For the second year running it enjoys the most glorious of weather; beautiful conditions in which to worship at the altar of an art form that is experiencing an Indian summer itself. For two days and nights at the intersection of Greenland Street and Flint Street, this part of the city’s Baltic Triangle is transformed into Merseyside’s very own Haight-Ashbury. 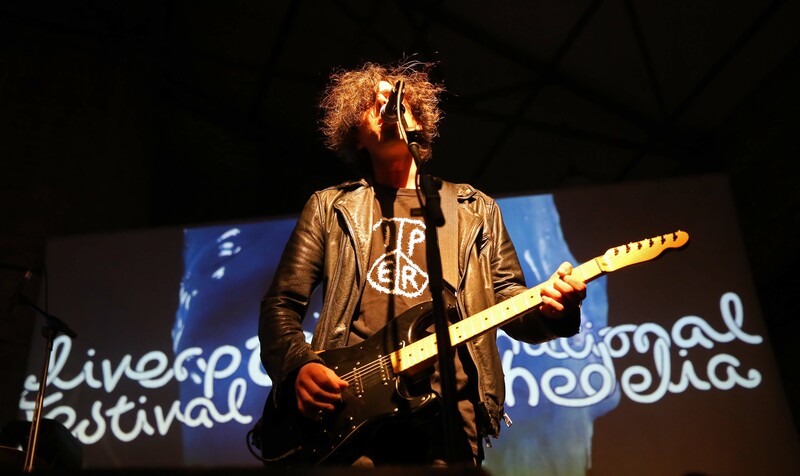 Back for its fourth edition, Liverpool Psych Festival returns to the scene of last year’s triumph, occupying once more the warehouse premises of Camp and Furnace. Together with the adjoining Blade Factory and the newly added District, these huge former Victorian storage spaces not only forge direct links with Liverpool’s nautical past, but also the creative renaissance of psychedelia. Innovative, experimental and practised in the art of mind-expansion, Liverpool Psych promises – and delivers – much more than mere music. For 36 absorbing hours it offers an experience that steps outside of, and then way beyond the ordinary. Drawing from many points on the creative compass – including classic cult film, fully immersive visual art and individual screen-printing – the festival attracting artists from all around the world. Friday night in Furnace sees an epic sonic face-off between two of the most revered independent record labels – Brooklyn’s Sacred Bones Records and BYM (Blow Your Mind) Records from Santiago in Chile. Representing the former, Arizona’s Destruction Unit are everything and more that their name suggests. They just grab you by the ears and then batter you into helpless submission with a feral assault on the senses. Their music is loud, primitive and totally uncompromising. Fellow label mate Benjamin John Power – here in the guise of Blanck Mass – takes a more esoteric approach to sound, washing the late evening crowd down in wave after wave of synthetic, symphonic spume. From the Southern half of the American continents comes The Ganjas. They are an outfit who take their collective hat off and nod in the general direction of dub, space rock and the blues. But for all of its apparent familiarity, their fine alchemy of sound ultimately finds itself an interesting home in some fairly unexpected musical places. Running in tandem to this titanic struggle between these two imprint heavyweights is an equally adventurous line-up in the adjoining Camp. Here, appearing one after the glorious other is a cavalcade of thoroughly modern psychedelia. Jacco Gardner is in the vanguard of this lysergic journey as he leads us first into a past populated by Brian Wilson, Curt Boettcher, and Arthur Lee before emerging into the present with his own interpretation of a brave new world. The festival’s Artist in Residence Anton Newcombe takes to the stage next, in collaboration with the young Toronto singer-songwriter Tess Parks. Showcasing material from their recent album I Declare Nothing, and backed by a four-piece band, they have a shared passion for repetition, obfuscation and adventure. Referring specifically to the difficulties he was facing in hearing what was being played, Newcombe later tells me that the performance was like “a leap of faith”. For something that was apparently so intangible, it felt remarkably coherent. It is a very long way from St Petersburg to Liverpool as Pinkshinyultrablast overcome travel problems and tiredness in a mesmerising trajectory that joins some of the dots between the Cocteau Twins, Chapterhouse and the avant-garde. It then feels entirely logical to spend some time in District in the blissful company of Graham Massey’s Toolshed who look and sound like they are the lost Mancunian disciples of that great free jazz explorer Sun Ra. Saturday lunchtimes will never be the same again. Girl Sweat is no barefoot contessa. She is a he and hails from Stockton-on-Tees. Hear him play, though – some cranked up, super-frazzled, tape-deck electronic freak-out – and you would swear he had been conceived in Detroit’s Grande Ballroom. This proto-garage racket was undoubtedly one of the highlights of the entire festival. And not too long afterwards comes another. One of a number of the most magnificently named bands at Liverpool Psych this year is Roy and the Devil’s Motorcycle. This four-piece from Switzerland – not a nation readily associated with mind-blowing psychedelia – treat us to a compelling blast of cosmic country blues that owes much more to the Grateful Dead than ever it does Gram Parsons. Their performance bisects a couple of the informal conversations that are taking place in the relaxed surroundings of the PZYK Cinema throughout the course of Saturday afternoon. First up is celebrated author and journalist Rob Chapman. Interviewed by Bryan Biggs – the Artistic Director of Liverpool’s centre for the contemporary arts, Bluecoat – Chapman is in an expansive mood. He covers a wide range of topics from British light entertainment shows to the questionably creative powers of acid, and The Festival of Britain in 1951 to his hypothesis that The Beatles were really a girl group in two key stages of their musical output, one of which was their psychedelic period. The omnipresent and most personable Anton Newcombe is similarly verbose when speaking to Dom Gourlay from Drowned in Sound. The Brian Jonestown Massacre frontman expounds at considerable length about psychedelia and the capacity it affords people to live the way they want to live, and thus be able to create their own futures. He also talks about how record companies had tried to mould him as the next Kurt Cobain, and what it was like to play the Pyramid Stage at Glastonbury immediately prior to Leonard Cohen. Without needing to hear him speak, you always suspected that Anton Newcombe was a man who had seen and heard a lot. The vague illumination from a neon “Key Cut” shop sign aside, Sun Araw perform in almost complete darkness. This opaque setting adds yet a further dimension to the apparent impenetrability of their music which gives the word experimental a totally new and bewildering meaning. An hour or so later on the self-same stage, Jane Weaver’s psych-folk come space-rock sounds positively commercial by comparison. Despite ending their set with an almost hymnal dirge, the Leeds’ five-piece Hookworms continue to blaze an unrelenting trail that rejects concession and compromise in favour of obliteration and subjugation. As the temperature rises in Furnace to accurately reflect the venue’s name, Spiritualized take to the stage and for 90 majestic minutes they confirm their primary position in the rock’n’roll cosmos. Jason Pierce continues to sing about Jesus, heroin and life, his words still beautifully framed in music that remains a quarter of a century on melancholy, mystical, magical and quite reassuringly magnificent. And with that the fourth annual Liverpool International Festival of Psychedelia starts to draw to a close. It has been intense, intimate, and occasionally brutal and its fire has burned bright for two whole days and nights. In that time we have enjoyed a shared collective consciousness, a communal connection that has taken our minds to some of the outer limits of audio and visual exploration whilst leaving our bodies firmly located in a beautiful psychedelic corner of Liverpool’s post-industrial Baltic Triangle. Liverpool International Festival of Psychedelia was held on 25th and 26th September 2015 at Camp and Furnace, Blade Factory and District.